Twistyplexing is a neat variety of Charlieplexing, with 2 small benefits. The above layout has N = 7, yielding 42 LEDs. 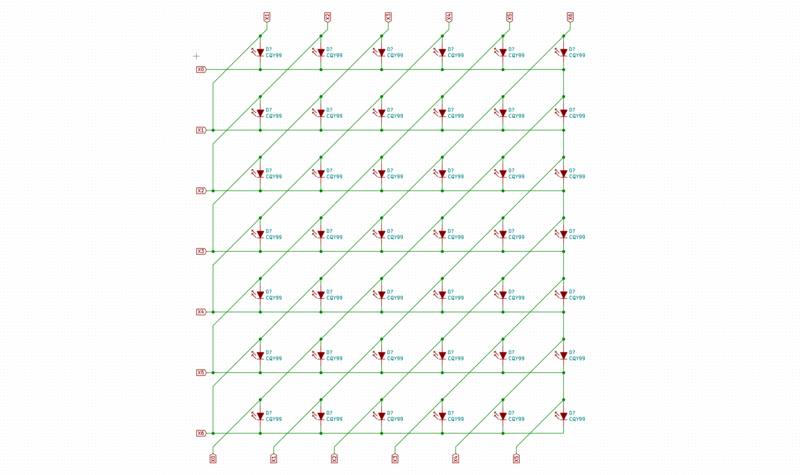 Apart from the symmetry being visually pleasing compared to the normal row & column Charlieplexing layouts, it's relatively easy to spot errors in the schematic. The major advantage of twistyplexing is the ability to avoid lookup tables and replace them with some relatively straight forward arithmetic. Of course the cathode still has to be controlled, but its pin id already defined by the row variable above. The Twistyplexing concept was created by Tom Yu, and defined in this blog post.